BlackBerry's been struggling in recent years to resonate with modern smartphone users, but ask a few who stuck around and actually used the company's recent handsets and you'll probably find them all singing the praises of the same thing: the all-your-communication-in-one-spot BlackBerry Hub. Now a new rumor suggests that a very similar feature could soon be coming to Samsung phones. Reportedly, we could see Samsung introduce this feature later this year with the debut of the Galaxy Note 6, where it looks set to arrive under the name Samsung Focus. Samsung Focus is tipped to bring email from multiple sources together under one roof, offering a unified inbox that sounds perfect for busy users juggling a bunch of different accounts. Beyond that, we're supposed to see calendar access, contacts, and memos all popping up. We're not sure if that's a complete list of stuff that Focus will help streamline the way users access, but it looks like a solid start. Viewing options could expand past standard temporal sorting to also include contextual groupings, letting users see all items related to specific tasks on their to-do lists, for example. Maybe the most interesting thing about this rumor isn't the Hub-like feature set for Focus, but the design decisions Samsung's making in crafting the app: this might be one of the least Samsung-looking apps from the company ever. Instead, it could be a by-the-books Material Design UI with little in the way of extra flourishes distracting the user or complicating navigation. While Samsung Focus is tipped to launch alongside the Galaxy Note 6, Samsung may not withhold the feature from earlier phones to emphasize it as a selling point for the GN6 and future Galaxy models, and it sounds possible we'll see it arrive as an update for current handsets like the Galaxy S7. Wait a minute... Wasn't Samsung Focus a Windows Phone device? Yeah. I remember that one. Yep. The Focus, Focus Flash, Focus 2 and Focus S.
As long as it can be disabled if I don't like it I'm good. Why is everybody referring to it with BB10 Hub? Nokia was FIRST with such an app when they released the Nokia N9. The main difference: N9 you had to swipe down to the see the Notification/message Hub where as on BB10 you had to swipe from left to right. Absolutely correct. The Nokia N9 had it first. 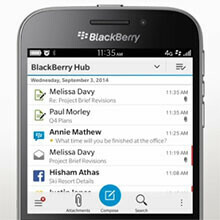 But: BlackBerry Hub has more functionality. If Samsung's version seeks to add all the features of BlackBerry Hub, then people are going to refer to that. The N9, sadly, is not even a distant memory to most. I bet that most people here don't even know what the N9 is without having to look it up first. Samsung executive: "What do our customers want in the next Note?" Samsung Software Design: "Oooohhhh....I know!!!!" Samsung executive: "The floor is yours Troy." Samsung Software Design: "They want....(insert drumroll here).....MORE BLOATWARE!!!!!! YEAH BABY I'M BACK!!!!!" Samsung executive: "Ship it.....ship it NOW!!!" Eh. Note phones are primarily meant to be productivity devices. If they can find a way to enhance that, I don't see any issue with it. Aside from that, what you see as bloat/gimmicky can be highly useful to someone else. One of the main issues I've had with how much that is thrown around nowadays. Fair enough. But considering Samsung's past transgressions regarding software features, I have my doubts. If they can manage something close to the BB10 Hub, they will have a winner on their hands. The BB10 Hub was the greatest thing about my BB10 devices. Google Play Music, G+, Google Movie, Chrome are more disgusting than S-voice and any samsung native apps. You telling yourself chrome, one of the most used browers on the planet, is worst than S-Voice. Thats rude... It is not bloat. Added funcionality is not bloat. There are some reviewers calling even useful microsoft apps bloat. RIP to them. I hope it's not like the Hub that comes in the Priv, that is a shell of the BB OS10 Hub. I have it disabled on my Priv, it's nowhere near the same. Totally agree. I really hope BlackBerry makes the Hub on the PRIV a lot more like the Hub on BB10 with future software updates.